No, it’s not the penal code. Happy 4/20! April 20, of course, marks the annual celebration for all things cannabis. And this year’s celebration might be even more enthusiastic considering support for marijuana legalization is at an all-time high. But how did 4/20 become synonymous with getting baked? Myths abound. In fact, recent consensus traces the origins of 4/20 back to a treasure hunt, according to the History Channel. In 1971, five high school students in Marin County, Calif., created a ritual for getting high. They would meet at 4:20—when most after-school activities were done—and smoke near a specific wall outside of their school, earning them the nickname the “Waldos.” The number became a code for meeting up. Then the friends would venture out into the nearby Point Reyes National Seashore to find cannabis plants rumored to have been abandoned. Some say they even had a treasure map. That might have been the end for “4/20”, if not for the Grateful Dead, the famous rock band. 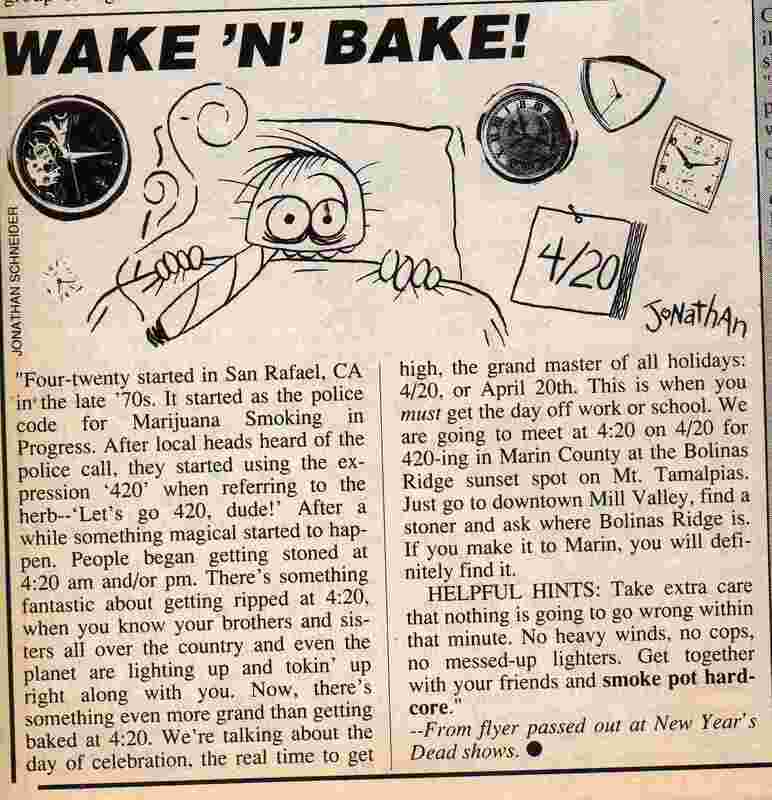 In December 1990, Deadheads in Oakland, Calif. passed out flyers encouraging everyone to “smoke pot hard-core” at 4:20, but they didn’t stop there. Thus, 4:20 and April 20 became forever marked as weed day. Update, April 21, 12:20 p.m. EST: After publishing, Mother Jones reader John Reynolds sent me an email with an image of the original Grateful Dead fan flyer attached from December 30, 1990. Reynolds, 51, now lives in Alexandria, Va. Back then, he was traveling to the Bay area and decided to see the Grateful Dead in concert at the Oakland Coliseum Arena with a friend. “All of it was just so relaxed and cool,” he recalled, adding that famous rock concert promoter Bill Graham was in the coliseum playing volleyball. Well, most of it was relaxed. “We saw a guy get held up with a knife for his dope,” Reynolds said. For Reynolds and his concert-going buddy, the flyer has become a sentimental—and humorous—artifact of another time: “George is the only evil Bush” is written on one side of the flier. Correction: An earlier version of this article referred to Point Reyes Forest. It is in fact Point Reyes National Seashore.